KAMPALA – Mr Ofwono Opondo, the Executive director for the Uganda Media Centre has attributed the ongoing controversies surrounding the struggling opposition Forum for Democratic Change (FDC) to Dr Kiiza Besigye saying he is responsible ‘change of wing’ that is blowing away the party towards an antagonistic and irreconcilable point. Opondo in a dossier said that the state of affairs within Uganda’s biggest opposition party that also tempts one to write a political obituary of FDC has been created by former party president Besigye. 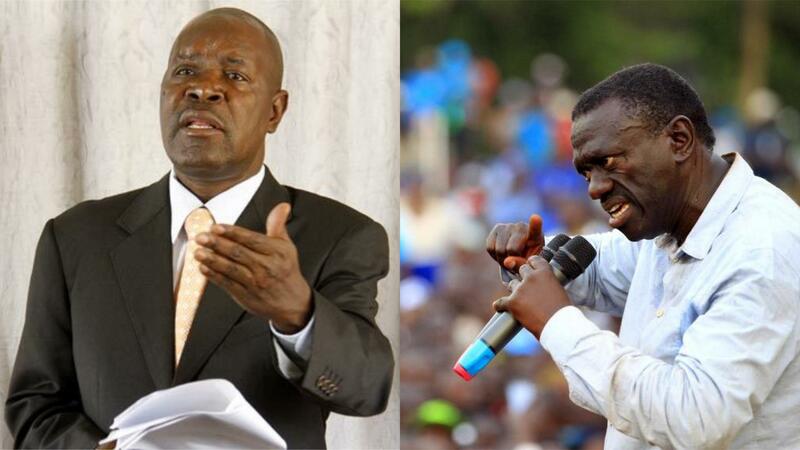 Opwondo slammed Besigye for alleging that he is a self-made man. “Rather, Besigye was pampered by Museveni, and is an extremely self-conceited personality, who has demonstrated double standards, and a great appetite for power,” he said. On FDC controversial mid-term reshuffle parliamentary leadership with Kasese Woman MP Winfred Kiiza dropped as Leader of Opposition (LoP) and replaced Gulu Woman MP Betty Aol, Opwondo said that the ‘purge’ aimed at eliminating all Teso MPs seen not to offer unconditional loyalty to Besigye and his defiance agenda. “Besigye’s recent snide reference, that Robert Kyagulanyi (Bobi Wine), is “a non-starter and inconsequential,” and “shouldn’t waste his time standing against Museveni,” implying; only Besigye can. Kyagulanyi ought to be left to market himself for whatever office his heart desires,” he further said. While it may still be too early to write the political obituary of the Forum for Democratic Change (FDC) party, the events that have rumbled during the past one year, and still going on, tempt one to conclude that the ‘change of wing’ is blowing away FDC towards an antagonistic and irreconcilable point. The election defeat of Mugisha Muntu by Patrick Amuriat Oboi for the party presidency last year has now culminated in what many within and outside FDC, have described as purge, although officially, it’s touted normal and routine changes. There is the ongoing groundwork for a possible open hostility and split. But whether it is a change of wind or wind of change, there is a foul political smell, and if this is the best team Amuriat can assemble, many even within FDC, see big troubles ahead, although we all give them possible support and the benefit of the doubt so they fall on own swords. Years back, John Nagenda, derisively referred to FDC as Fall Dawn Completely, enlisting a prolonged vitriolic backlash from many of its supporters, who perhaps, viewed Nagenda, as an NRM and President Yoweri Museveni’s protégé who didn’t wish them well. Nagenda had castigated FDC’s formation, as essentially by people he termed as “disgruntled” driven by their own failures in the old NRM, urged on by elements from the old discredited Uganda Peoples’ Congress (UPC) and Democratic Party (DP). In that regard, Nagenda, during the 2006 general elections, advised that a group solely motivated by hate, and lust for power for its own sake, as Kizza Besigye Kifefe and FDC, then appeared to be, didn’t deserve to be elected to lead government by the people of Uganda. Since its formation, and employing rubble-rousing strategy to lure the unsuspecting youthful population, FDC got consumed in hate politics, and falsely believed that, Besigye, who was previously a physician of his bush war colleagues, served as internal affairs state minister, and later National Political Commissar (NPC) of the NRM, understood the NRM political ideology, discipline, and had mettle to dislodge President Yoweri Museveni. Wearing a badge of an army colonel, given without formal or professional training, Besigye has frequently bragged that knows NRM’s internal weaknesses. For a long time now, many of us have consistently told FDC supporters and Ugandans generally, that as far as NRM politics is concerned, Besigye was never a self-made man. Rather, Besigye was pampered by Museveni and is an extremely self-conceited personality, who has demonstrated double standards, and a great appetite for power. Equally, in the opposition, Besigye opportunistically occupied the vacuum created by DP and UPC who then offered him a free platform. Opportunism is any behaviour that aims to increase one’s influence regardless of style and price, whenever opportunities arise. It’s criticised for being narrow-minded and aptly applies to Besigye who despite many failed attempts to deliver victory to FDC is clinging on. Since 1999, when he fell out, he has raised hubris, but that is a far as he goes, it is perhaps time for him to voluntarily leave or be pushed out because he is not adding much value to either FDC or the collective opposition. Besigye, instead of harmonizing the different tendencies within FDC, with a view to advance common objectives, is seeking self-perpetuation. As Besigye continues to gang-press FDC leaders, members and opposition supporters, last week’s changes point to alienation of Amuriat from Kasese and Teso regions, where, hitherto, the party enjoyed a relatively high electoral support at all levels. The purge eliminated all Teso MPs seen not to offer unconditional loyalty to Besigye and his defiance agenda. The purge, which many say preferred little known’s, from the 37 FDC MPs, is likely to be rockier. Besigye’s recent snide reference, that Robert Kyagulanyi (Bobi Wine), is “a non-starter and inconsequential,” and “shouldn’t waste his time standing against Museveni,” implying; only Besigye can. Kyagulanyi ought to be left to market himself for whatever office his heart desires. Amuriat’s strike at committee leaderships where he has positioned his loyalists is also instructive because they are a major source of funding for party activities. Information available indicates that chairpersons, especially of accountability committees, habitually gang press accounting officers, and heads of government agencies for money, some of which are remitted to the party secretariat. In fact, many insiders say, it is partly why government accounting officers are put under so much pressure whenever they appear before committees, and there have been many instances of public disagreements involving counter-accusations among these MPs. In addition, committee members usually conduct field trips purportedly to audit public institutions and monitor delivery of services where more pressures are piled on public servants. For now, FDC defiance wing appears to have won and chosen to call a bluff, ready to move on without seeking reconciliation although continue paying lip service to it. That has enlisted a more hostile posture, from Muntu’s camp, including over Arua Municipality by-election, where party deputy spokesperson, Paul Mwiru and others, are backing Kasiano Wadri, from their camp against FDC candidate, Bruce Musema.